The Gloster Gladiator was a British-built biplane fighter developed from the Gauntlet and its prototype, designated SS.37, flew in September 1934. Following testing and minor modifications the first production model, the Mk.I, was delivered from July 1936 and became operational in January 1937. The Gladiator Mk.I was a single-seat biplane of metal construction with mixed fabric and metal covering. It was fitted with a fixed undercarriage and powered by a Mercury radial engine turning two-blade wooden propeller. Its armament consisted of four guns, of which two were mounted in the fuselage and two under the lower wings. In total, 378 Gladiator Mk.Is were produced and supplied during 1937-38. Belgian Air Force operated 22 aeroplanes, while China acquired 36 Gladiators. 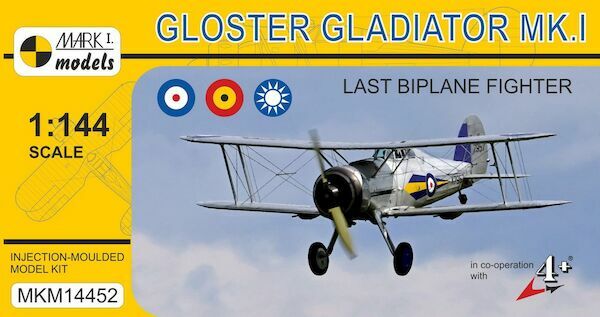 The Gladiator was the RAF's last biplane fighter aircraft and the first with an enclosed cockpit. Although rendered obsolete by newer monoplane designs, it proved good in initial combats and saw action in almost all theatres during the WWII. Gladiators (both the Mk.I and Mk.II versions) were successfully exported to many countries and saw service with more than 15 air arms, including those of Belgium, China, Egypt, Finland, Free France, Greece, Iraq, Ireland, Latvia, Lithuania, Norway, Portugal and Sweden. They also equipped RAAF and SAAF squadrons in the Middle East and North Africa. This injection-moulded kit contains 34 parts, one resin part and one clear part (cockpit canopy). A comprehensive instruction leaflet and a decal sheet are included.